Believe it or not, this recipe has something in common with Henry’s dog treats from yesterday. The link? The parsley. Lots of parsley. Henry’s birthday was yesterday and I made breath buster treats with parsley. The recipe required dried parsley but I purchased fresh flat-leaf. I couldn't pass up the price. At the end of the day I really didn’t have it in me to 1) make dinner, 2) dry parsley and then 3) make dog biscuits. So I opted for a quick stop at the bulk store to pick up some dried. But that didn’t negate the fact I now had an excess of parsley that had to be dealt a mortal blow. And quickly. It only really lasts a day or two. There’s no more sure way to kill a lot of something green than to make pesto. Making pesto takes a lot of whatever you use. 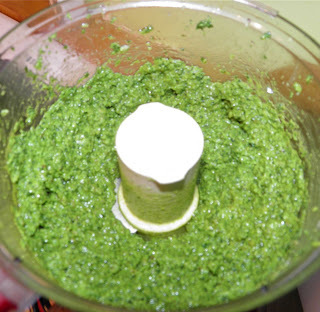 A traditional pesto is basil, garlic, pine nuts, olive oil and some salt an pepper. Enough basil to make pesto (about 2 bunches) is expensive in the off-season, as are pine nuts (always pricey). If you switch out those two ingredients your possibilities really open up. Instead of basil, try parsley or cilantro. Instead of pine nuts use walnuts, cashews, Brazil nuts—any kind of fatty nut. 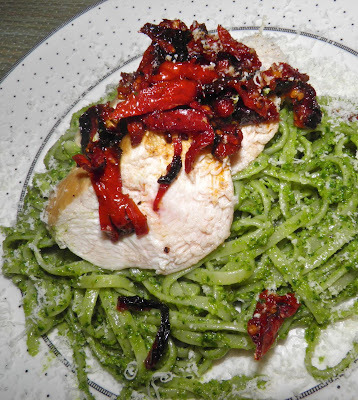 Making a meal with pesto-tossed pasta as the base is a quick and healthy meal. Even if you make your own pesto, it won’t take you 15 minutes. Then just toss together and top with whatever you want. I like pairing with chicken, but shrimp or scallops are equally as good. You could also round the pasta for a meal out just by tossing with crumbled bacon. No need for anything else. If you've never made your own pesto you should give do it at least once. Although not “strictly” traditional, Italian parsley is a nice way to introducing this easy sauce to your repertoire, without the traditional expensive ingredients! This pasta is not spinach. All the colour comes from the pesto. Bring a pot of water to a boil for the pasta. Reduce the heat to keep it hot while you make the pesto. To make the pesto, wash and chop the full bunch of Italian parsley into 2” long pieces. Discard the stems. You should have about four cups. Place the garlic and walnuts in a food processor. Pulse, and then add about 1/4 of the parsley. Turn on the motor and add enough olive oil through the spout to allow the mixture to move in the bowl. Add more of the parsley and the a little oil, repeating until all the parsley is processed. The mixture should move in the bowl, but not be too liquid. Add the cheese, some salt and lots of pepper and pulse to combine. Taste to make sure the sauce is salty enough. Adjust if desired. Set aside. Pour a little oil in a frying pan with a lid. Sear the chicken on high until browned on both sides, about 1 minute per side. Chop the sun-dried tomatoes into thin slices and scatter around the chicken. Add a little water and cover the pan with the lid. Reduce the heat to simmer and let cook for 10 minutes. While the chicken steams, cook the pasta. Once the pasta is cooked (8-10 minutes), drain and toss with about 3/4 to 1 cup of the pesto. Refrigerate the other half of the pesto and use within 4-5 days. Once the pasta is cooked and the chicken is steamed, remove the chicken to a cutting board and slice. To serve, place some pasta on a plate, top with a few chicken slices and then some of the sun-dried tomatoes. Grate more parmesan on top if you wish.